For self-aware mammals like humans, stress signs are a good thing because that's what helps us navigate and function in our daily lives. For dogs, on the other hand, there's no way to use that information to their advantage without the help of owners. Recognizing signs of stress in dogs is vital for the overall well-being of your Fido. Stress in animals, and dogs in particular, has been actively studied for the last three decades (1, 2, 3, 4, 5, 6, 7) and researchers found effective ways not only to distinguish signs of stress in dogs but methods on how to relieve it quickly. More studies are ongoing and find new tell-tale signs like dog's mouth licking and causes of stress like lack of sleep. Understanding your stressed dog's behavior is the only way to prevent further health complications. Your dog’s refusal to eat is one of the first and most common sign he's likely stressed out. This can also be a sign of apathy, boredom or depression in the dog, all of which are more or less related to stress, too. Your dog exhibits slow movement, lip licking, exposing his underside, turning his head away or averting his eyes – these are signs of stress in dogs, and often go hand in hand. Your pooch becomes less interested in things, more apathetic. Your normally playful dog is now shut down, consistently turning away, and avoids your touch. Like with humans, tummy issues are often related to mental health. The dog's digestive system is very sensitive to stress, and repeated vomiting and diarrhea (among other GI issues) could be signs of stress in dogs. Excessive blinking, yawning, chattering teeth, nose licking, scratching, shaking off as if wet when dry. Each case separately will usually be a tell-tale sign of something else, but when a few are paired together, it could mean your dog is stressed. Dogs are not cats and generally do not groom themselves too often. However, when stressed, dogs may excessively groom themselves even to the point of self-mutilation. Hyperactivity is a common problem in canines and has been well-studied. When your dog engages in frantic behavior or constant restless pacing without stopping, stress could be the cause of it. Your dog wants to be in constant contact with you for reassurance. Pets who feel unease due to stress instinctively seek the help of and closeness to their owners. Not always proven signs of stress in dogs, but slinking, cowering or being sneaky may be indication that your pooch is experiencing something uncomfortable. This could go from gentle nibbling to painfully hard mouthing or snapping, all the way to biting. Mouthing is a common behavior problem and indicator of other problems, so you'll need to watch out for other signs of stress in dogs alongside this one. Your dog is breathing heavy or taking shallow rapid breaths, but hasn’t been physically active. When clearly observed, it's one of the more obvious signs of a stressed animal. Like panting mentioned above, if your Fido hasn’t been physically very active, sweaty paws may be a sign that he's stressed out. All dogs shed, but a stressed dog will clearly show an increase in shedding. You'll start seeing a decrease in the amount and health of his fur, and begin finding far more dog hair around. Like mouthing, destructive behavior is common in dogs and can be caused due to many other reasons. However, studies show that dogs may try to alleviate stress by chewing or biting furniture, or even themselves. You'll know your pooch may be stressed when sniffing has taken priority over your commands or other things normally important to your dog. Your house-trained dog is now backtracking on training. He doesn't understand that he needs to ask to go out, and doesn't “remember” how to hold his pee. Many dogs who don’t often do this otherwise will draw their ears back and low when under stress, and maintain this (possibly with cowering and lowered posture) for prolonged periods of time. Your dog is sleeping significantly more than usual, which is one of the most commonly observed signs of stress in dogs. Interestingly, an increased amount of stress can also be caused due to lack of sleep, making it a closed circle. The dog who normally doesn’t bark a lot is now constantly whining, howling or barking. This has been going on for hours and maybe days, and you know there's no reason for your pet to bark, meaning that he's likely experiencing a mental health issue. New physical symptoms resembling illness like allergies or skin problems may be a sign of stress. 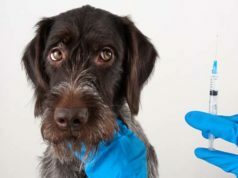 There's a large number of physical health problems your pet will experience when stressed, and those are usually hard to pin down without testing at the vet clinic. Exposure to novel items, animals or people. Separation from human family members. Negative training methods like punishment. Loud noises like thunderstorm or fireworks. Constant disruption when eating or sleeping. Lack of outlets to exercise, herd, run or retrieve. Excessive changes in house rules and routines. It's likely you'll have to work through every single one of these stress causes to pin down the exact one, and it's possible there's more than one. A game of fetch or a long walk are the best ways to reduce stress. Try to avoid situations and places that you know may cause stress. See if the dog’s diet is well-balanced. Proper nutrition is an integral part of your dog’s overall wellbeing. When you set any rules, do not change them so your pet knows what is to be expected. Provide your dog with a safe zone. The dog needs some space with a bed, crate or blanket to escape from your now and again. Daily walks and some play time may not be enough, so try to find more time to be with your pet. Remember that even when you begin seeking help for your stressed pooch, it's best to be aware of your pet's condition and not make it worse. For example, vet visits are likely to cause even more stress to your dog but there are ways to make them less stressful. The same applies to all other situations when trying to fix the problem.